These special invitations are perfect for bridal showers, engagement parties, and anniversary parties! Select any 2 of our cartoon people to resemble the wedding or anniversary couple, and we'll custom print it with your text. Cards measure 5" x 7" and have a pearl foil border, and are custom printed in full color with your own wording. Price is per card. Plain white envelopes are included. Click to see the available options. Make note of the HEAD NUMBER shown beneath the one you choose. For example, M5, M12, etc. Facial hair can be added to any of our men's heads. 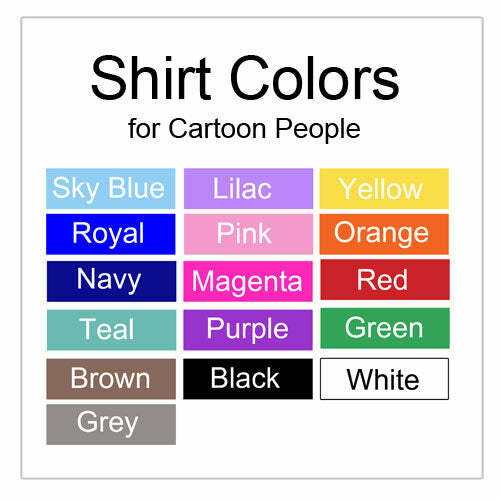 All cartoon people are available with fair, medium, or dark skin and blonde, brown, red, black, grey, or white hair. Glasses can also be added to your person. See the skin, hair and grad gown colors tab for examples. Click to see the available options. Make note of the HEAD NUMBER shown beneath the one you choose. For example, W10, W12, etc. All people are available with fair, medium, or dark skin and blonde, brown, red, blac, grey, or white hair. Glasses can be added to any person. See the skin, hair, and clothing options tabs for examples and options. Click to enlarge to see the available options. You can add multiple options to a person as long as they are on different parts of the body. For example, you can add glasses, earrings, a hat, and a the shirt with the pearl necklace to your person, but you cannot combine the pearl necklace with a tank top.